We would like to extend our thanks and congratulations to the friends and family of two year old William for having already raised in excess of £3,000 in their Million For William campaign. William’s parents, Adele and Keiron, and big sister, Rhianon, have been the driving force behind the campaign and they have been beautifully supported by close friends and relatives. Their hope is to raise £1M which will be donated to the Myotubular Trust and other charities that are close to their hearts. 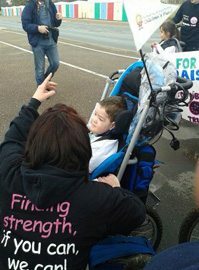 There have already been some fantastic events which have been incredibly well attended – a 5 mile bike ride which William took part in and enjoyed, a marathon, a fight night and a fundraising event at the nursery in Cardiff that William attended before the family relocated. 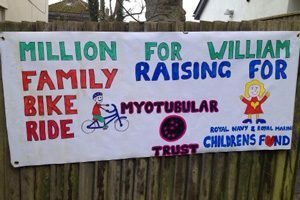 Not only that, the most amazing hand made cake was donated and auctioned, family friends and relatives have displayed collection boxes and they have sold a large number of Myotubular Trust wristbands too. And on top of all that, Adele and her close friend Zena are currently organising a ball in Exmouth on 5th July 2013. Guests at the black tie event will be treated to live music, have the chance to play at casino tables, buy raffle tickets and bid in the silent auction, and enjoy the table magician, have their photos taken and much more. Tickets cost just £30 and if you would like to purchase any, please email contact@myotubulartrust.org If you are able to donate a raffle or auction item for the ball, we would love to hear from you.